Many fans like to walk from the University of Oregon campus and Franklin Blvd area. While there are many ways to approach Autzen Stadium through Alton Baker Park, the most popular route is where Agate St and Franklin Blvd intersect at Riverfront Prkwy. Cross over the Autzen pedestrian/bike bridge and follow the crowd! 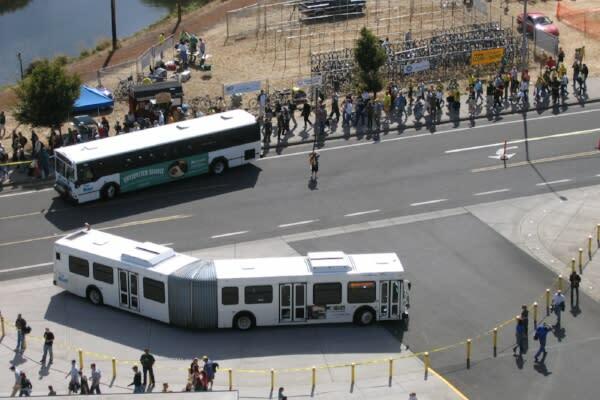 Lane District Transit (LTD) offers round trip game day shuttles to Autzen Stadium. Autzen Express buses begin three hours before kick-off and run every 30 minutes for the first hour and then every 10 to 20 minutes. Buses depart from eight park and ride locations (LTD Downtown Eugene Station, Lane Events Center, South Eugene High School, Valley River Center, LTD River Road Station, RiverBend Annex in Springfield, LTD Downtown Springfield Station and Thurston High School). Round-trip tickets are $5 each. Return trips are only available during halftime and immediately after the game for 60 minutes. Rent a PeaceHealth Ride bike and ride it to Autzen Stadium. On game days the designated riding area will be expanded to include the stadium. Bike racks will be at Autzen&apos;s north and south entrances. Or if you prefer, ride part way and park your bike at the existing PeaceHealth Ride hub south of the river and walk the remaining way. The heavy pedestrian traffic on game days can make riding a bike more difficult, especially over bridges. If you do decide to ride, please give pedestrians the right-of-way and walk your bike through the congested areas. 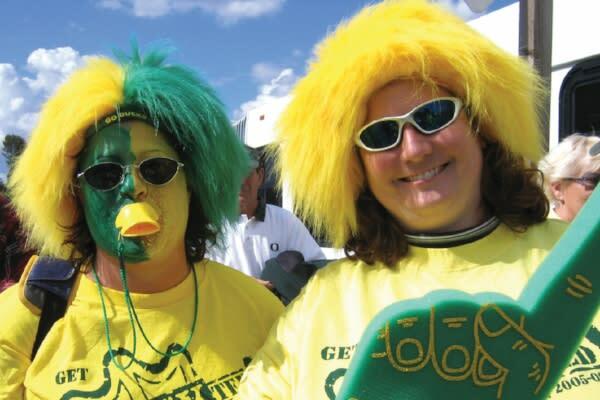 Autzen Stadium&apos;s parking lot opens six hours before kick off and requires reserved parking passes provided exclusively to Duck Athletic Fund members. For large groups, contact Hospitality Services at 541.346.4475. All other season and single ticket holders can purchase advance parking passes at the adjacent Eugene Science Center. Boy Scout Troop 100 offers more parking access at lots along Martin Luther King Jr. Blvd, both reserved and first-come, first serve spaces. The Masonic Lodge (541.344.9413) also sells tailgating spots across from Autzen. A great indoor venue for pre-game entertainment is in the Ed Moshofsky Sports Center connected to Autzen. The "Mo" is filled with many small TVs, food booths, beverage stations and plenty of tables. An easy, fun tailgating option that doesn&apos;t require a ticket to the game is at Essig Field, directly across from Autzen Stadium. Open four hours prior to kick off, this free outdoor venue provides a food court by McKenzie Catering, tented areas with tables and chairs and televised coverage of the game. Enjoy the beer garden offering domestic beers and local craft beers including McKenzie Brewing, Hop Valley and Ninkasi Brewing. The venue is family-friendly and so convenient you may chose to watch the whole game from here on their TVs. Private parties may also be arranged. If you aren&apos;t attending a pre-game function with catering and food booths, rent an RV or work with Cornerstone Tailgates & Events for a fun set up. Shop for tailgate supplies at local markets. There are many area restaurants that provide game day catering, including Cafe Yumm and Hole in the Wall BBQ. Fill up your cooler with local craft beer at a bottleshop or growler fill station. Please do not take open containers of alcohol onto public streets or sidewalks - it is against the law - or bring it into the stadium. The Cooler Restaurant & Bar and The O Bar & Grill are the closest sports bars to Autzen Stadium. Each is about a one mile walk to Autzen. Sixth Street Grill in downtown Eugene is a popular pre and post-game hang out. And Sam&apos;s Place Tavern off West 11th offers shuttle service to the stadium. Or visit TREV&apos;S Sports Bar & Grill on Franklin Blvd and simply walk with the students to the game. While you are cheering on the Ducks, please do so responsibly. Below is a list of taxis, limousines and additional fun ways to get out and about.